happy september first! as summer winds down to an end, i thought making fair/carnival food would be the perfect way to celebrate the last few days of summer (hi fall, i missed you). with the CNE taking place in toronto, fried food galore is being served including my favourite.. canadian fried pastry dough. you can check out the article i wrote for food52 on fried dough here & get the recipe below! now let's get ready to welcome pumpkin everything back into our lives again. in a large mixing bowl add water, yeast and sugar. Let stand for 5 minutes to allow the yeast to activate. If your yeast does not foam start again (water could be too hot or yeast could be expired). stir in whole milk, salt, vanilla, egg and oil. Mix until ingredients are well incorporated. add dough one cup at a time and mix until a dough begins to form. turn dough onto a floured surface and knead for 8-10 minutes, adding flour as needed until the dough is no longer wet & sticky. 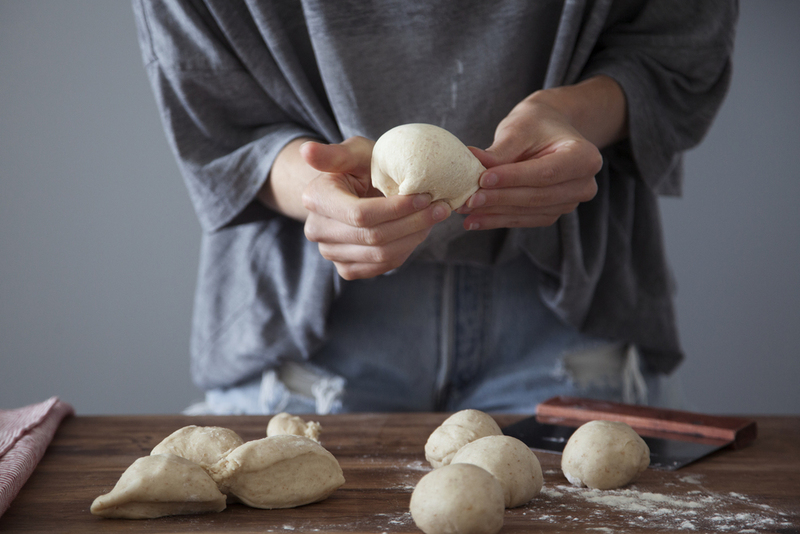 form into a ball and let rise in a covered bowl for 1 hour, or until dough as doubled in size. once dough has risen begin to heat your oil to 350-375 degrees. Pot or frying pan should be high enough to allow oil to be 3-4 inches deep. roll out dough to a flat oval shape that is about 1 cm thick. fry dough for 2 minutes on each side, and transfer to a paper towel to drain excess oil. brush with melted butter and roll in cinnamon sugar mixture. repeat frying one at a time until you have used up all your dough. close your eyes, pretend you are surrounded by farris wheels & games and take a bite into summer.